There’s something luxurious about having your rugs and carpets professionally cleaned. They smell good, the fibres feel exquisite between your toes, and there’s a certain peace of mind that comes from knowing that they’re hygienically fresh. But few people realise how important it is to have rugs and carpets cleaned on a regular basis. Rugs in particular are notorious for collecting dust, dirt, mud, pet hairs and oils, and can exacerbate allergies and create an unhealthy environment in your home. Myhome provides an expert rug cleaning service in Melbourne and the suburbs to treat, refresh and care for even the most delicate of fabrics – from nylon, rayon and acetate to wool, cotton and silk. We’ll inspect your rugs before cleaning to ensure we provide the safest and most thorough clean possible. After inspection, we use our Myhome exclusive Dry-Touch cleaning process to treat and remove even the toughest, deep-set stains. Dry-Touch provides such superior stain removal that we believe if we can’t clean it, no one can. Call us now on 13 22 31 or request a quote online. While most cleaning services continue to use traditional methods of chemical and steam cleaning (really ‘hot water extraction’) to refresh carpets and rugs, these methods can be especially damaging to fabric fibres. Chemical cleaning fails to reach deep-set dirt, while steam cleaning leaves rugs soaking wet and prone to shrinking. Both types of cleaning are notorious for leaving chemical deposits behind, which create an unpleasant smell, are unsafe to inhale and actually exacerbate dirt build-up. Dry-Touch is an exciting new development in rug cleaning services, using new polymer technology to encapsulate and effortlessly remove dirt, dust mites, pollutants and oils that can settle deep into rug fibres. 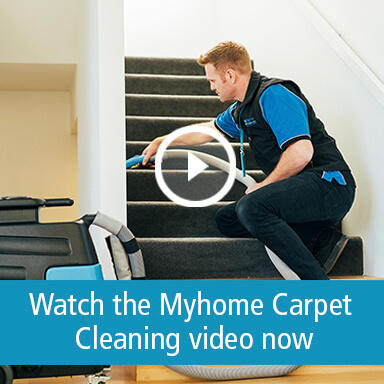 Myhome can bring the Dry-Touch technology to your home, our Rug Cleaning Service is available all across Melbourne – call us now on 13 22 31. Our technicians follow a six step encapsulation process for cleaning carpets and rugs that penetrates deep, removing hard-to-reach dirt and oils, without damaging the fabric with lingering chemicals. Once treated, rugs are vacuumed, groomed, and dry within one to two hours. 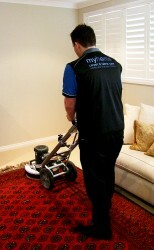 All our Dry-Touch services are followed by a post-clean treatment, where our Myhome technicians return the next day to ensure you’ve received what we believe is the most thorough and exclusive rug cleaning Melbourne has to offer. To find out more about our rug, upholstery and carpet cleaning services, please give us a call on 13 22 31 for a friendly chat. Alternatively, you can send us your enquiry online or request a quick quote.